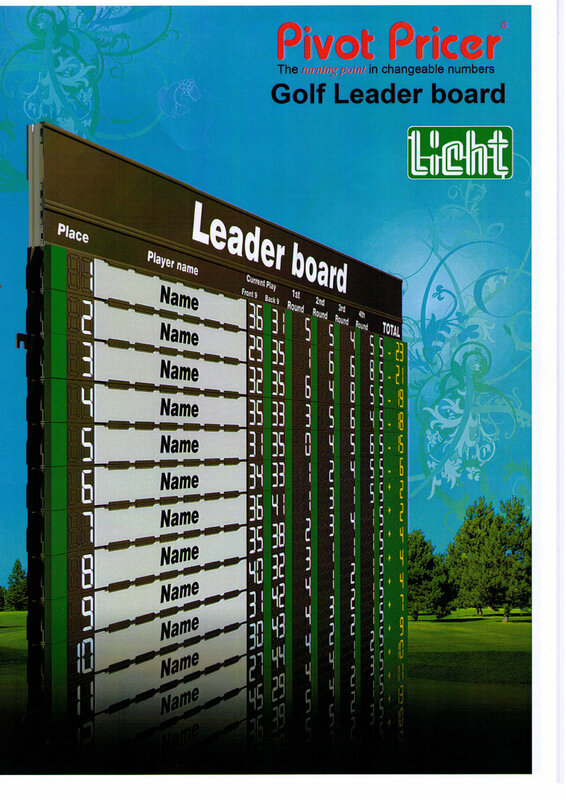 Licht Golf Score Board The world's finest golf tournament Progress displays. The gallery needs to know the score and we have made sure they can and do see clearly the current position of the players they are following. For example, it can be used on the PGA Tour. With the exception of that pressure putt, or the perfect middle of the fairway drive, the golf scoreboard is almost certainly the most anticipated and viewed item in any golf tournament, from local club events to international PGA contests. What the viewing public, officials and players want to see is the same all over the world of golf, and applies to every course and club. To ensure your next tournament is professionally presented, the use of our visual systems ensure that the task of keeping the gallery and players up to date is handled easily and professionally by our proprietary on-course score display system. Nothing could be simpler to operate than our world beating manual system, just flip the number segments around to update. And let us remind you that you have a full range of colour combinations and frame sizes to complement your clubs decor. It goes without saying that our systems are manufactured in-house to the highest standard and can handle the most severe weather conditions. By selecting and using our system, Licht A/S will give your golf club years and years of reliable service, this is our guarantee.